There is always something interesting going on at the Gimp Parade. Often enough it is timely and controversial. Win This Fight Councillor and I'm Off to Jamaica, Mon! But tell Mr. Russell to give the man back his seat and win his vote for our side! Senator Morris has my write-in vote the next electing in Jamaica. Or, short of resorting to election fraud, he has my word that I will try to make the sports fan haj to Jamaica (with a few of my friends) for the 2007 Cricket Cup. "There are millions of disabled persons with disposable income but they can't travel outside of their countries because the tourist destinations are not disabled friendly," Morris said. "As the tourist mecca, Montego Bay must lead the way." Continue reading Win This Fight Councillor and I'm Off to Jamaica, Mon!. Inclusive Tourism (Turismo Para Todos) has an institutionalized presence in Mexico. The Seventh Encounter of the Turismo para Todos Network of Mexico will continue the strategic planning and alliance building necessary to promote Inclusive Tourism. Leaders of the movement recognize the value of destination access to the large domestic travel market in Mexico. Meanwhile, Spain follows up on Queen Sophia's Universal Design Awards with a push toward accessible urban transport - another boon for domestic tourism. The Dominican Republic makes its support of Universal Design known internationally as it hosts the Organization of American States gathering. Continue reading Mexico Continues Strategic Planning for Inclusive Tourism. Geocaching is high tech treasure hunting. The treasure need not be of much value -- the joy is in the hunt. The technology is GPS (Global Positioning System). Continue reading Geocaching: Another Excuse to Travel. The seven principles of Universal Design speak to the equitable design of space, products, and policy. Tracing UD's impact on the travel and hospitality industry is a central theme of the Rolling Rains Report. So it is especially interesting to discover new language being developed around the value of Universal Design. Rereading Kate Bartkiewicz article in Vision Magazine, "There's No Place Like Home When You Do It Right," I noticed a new argument being made. Universal Design can lead to "a higher perception of group teamwork and job satisfaction." Continue reading "Do It Right" with Universal Design - Part II. The Oregon Coast Beach Connection has an article on some Memorial Day getaways. 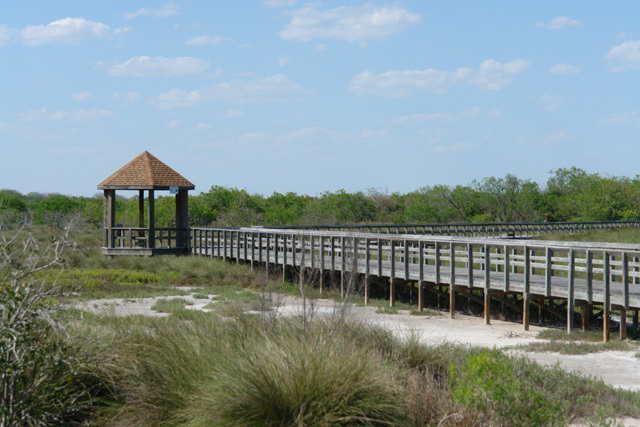 Try Smelt Sands Beach and the wheelchair accessible trail there. minor damage happened such as wall cracking and tiles. primarily for transporting relief-related goods and personnel. Semarang, the closest airport locations from Yogyakarta. Paul Murphy, Chair of the Cheshire Tourism for All Council, presented a report on the Cheshire Inclusive Tourism initiative. You will find the report as .pdf here. Tupelo architect Richard MCarty is quoted by Emily Le Coz in the DJJournal as saying"
"The beautiful thing about universal design," he said, "is it's kind of an invisible accommodation of a physical disability." Continue reading Richard McCarty gets "The Whole Idea" -- To the Benefit of Northeast Mississippi. More than 3,000 people have been killed and thousands more injured in a powerful earthquake which has struck central Indonesia. Homes and hotels have been flattened in the ancient royal city and tourist centre of Yogyakarta. eTN spoke to the Hyatt Hotel in Yogyakarta. The Hyatt is in the north of the city and the hotel and all guests are ok.
eTN talked to Mr Thamrin B. Bachri, vice minister of tourism. The Ministry of Culture and tourism sent its own team to Yogyakarta and did not yet get a report. The airport in Yogyakarta is closed and flights operate to Solo (100 km away from Yogyakarta). At present the eTN report is not posted online. The USS Lexington dominates the shoreline near the Radisson and Quality Inns north of Corpus Christi. Just down from the retired aircraft carrier is the Texas State Aquarium. The freshwater otters (nutrias) were a ittle too rambunctious to be caught in a photo. (Having three buss loads of science camp kids in the aquarium that day also contributed to limited photo opportunities.) The facility makes for an enjoyable afternoon excusrion that is quite accessible. Continue reading Corpus Christi - North Beach. Continue reading Corpus Christi Botanical Garden. Dry Wolf Campground southwest of Stanford, Montana sits in the Little Belt Mountains. Sonja lee, staff writer for the tribune, highlights several accessibility features of the newly reopenned campsite in here article "Little Belts campground in shape for long weekend." Continue reading A Memorial Day Holiday Suggestion from the Great Falls Tribune. This project of mine is celebrating it's 1st birthday this week, and what a great year it's been. Rollingpix has opened so many doors for me. I have travelled, met great people and hopefully opened some eyes with my photography and journalism about chair athletes. Continue reading Happy Birthday RollingPix!. The Christian Science Monitor has done a special report on AMTRAK here. 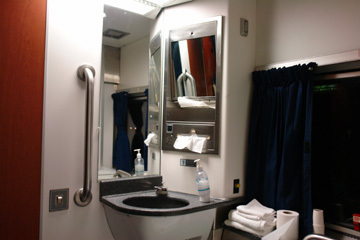 For those who have never traveled in or seen one of AMTRAK's wheelchair accessible cabins here are some photos. A new survey by Commonwealth bank is revealing about the retirement plans of Boomers:http://www.thematuremarket.com/SeniorStrategic/dossier.php?numtxt=7054&idrb=5 Home remodeling (a niche for Universal Design) and travel figure high in their plans. Continue reading Boomer Retirement Trends Include Travel and Home Remodeling. Young? Disabled? Want to Travel? Here is a chance to say something artistically. The contest "Destination Anywhere" holds out $60,000 in prizes for fifteen artists with disabilities. Read the announcement below by VSA arts and Volkswagen of America. Who knows, maybe you can get a ride in this cool Volkswagen! Continue reading Young? Disabled? Want to Travel?. Turismo Polibea regularly features informative articles on Inclusive Tourism. This article from May 2006 provides background on the evolving European Network for Accessible Tourism (ENAT). This is a positive development mirroring the work done in Asia. perhaps ENAT will offer a model for developing economies of scale linking the various local, regional, and national endeavors to promote inclusive travel. Continue reading Ivor Ambrose on Inclusive Tourism as Common Sense. Congratulations to Malaga, Valencia and Tenerife for their achievements in inclusion of citizens -- and tourists -- with disabilities. Málaga, Quart de Poblet (Valencia) and Bre?a Alta (Tenerife) were winners of the Premio Reina Sofía de Accesibilidad Universal 2005. Continue reading Three Beacons of Universal Design at the Municipal Level. Ratified but not yet published below is the English version of the EU regulations on travel and people with disabilities. The text will be signed June 14 and two weeks later. The regulation will take effect two years after the publication in the official journal of the EC, except for Articles 3 and 4 (on denied boarding) which will apply with effect from one year after the publication. Continue reading EU Policy: Rights of Disabled Persons and Persons with Reduced Mobility When Travelling by Air. Mention the concept of universal design to baby boomers and you'll likely be greeted with anything from disinterest to hostile silence. After all, who wants to think about the day he or she will have trouble walking up steps or getting in and out of a bathtub - much less be needing a wheelchair to get around. Few people want to believe they need or will ever need assistance to do basic everyday activities. So, few people really gain a full and clear understanding of universal design, and it remains cloaked in the misconception that it's only for individuals in wheelchairs, that it is for people whose active lives are "over" and that it's equivalent to living in an institution - certainly not aesthetically pleasing. Bernadette Todd uses her disability to dramatic effect -- and still gets the job done. Beyond the Ramp takes on legal issues of accessibility. Here is a post on the difficulties of hailing a taxi in NYC. Adrienne Schmitz is director of residential community development at the Urban Land Institute in Washington, D.C. below she writes on the demographics affecting housing trends. In an otherwise helpful article there is the phrase "universal Design features." Too often the phrase "Universal Design features" is used as an oxymoron. Continue reading "Universal Design Features" as Code for Bad Design. In the cruise ship industry "relocation cruises" take place twice a season to get a ship in position for its seasonal route (say Alaska half the year and the mediterranean the other half. What does the rental car industry do? Susan Foster is a regular rail communter in Suffolk, UK. She is also a wheelchair user. With stories like hers would you predict travel revenues to go up or down? Read "Wheelchair user angry at train operator"
Grand Coulee Dam: A Model for Tourist Destination Interpretive Centers? Having one hand, I still could interact with every exhibit. I am looking forward to returning and trying the iPod audio description of the exhibits. You can read her entire account here. Charis Dunn-Chan gives some travel tips for Paris at "A Wheelchair Tale of Two Cities." It's Time to Visit Tempe, Arizona! I received an announcement of a new accessibility guide for Tempe. Soon I hope to have a copy for review ( annd then sneak in a trip down). Tempe, AZ – The Tempe Convention & Visitors Bureau (CVB) has just released Access Tempe, a comprehensive guide to Tempe’s and Arizona State University’s (ASU) accessible features. Access Tempe was produced to help answer the needs of Tempe’s residents and travelers with disabilities. Continue reading It's Time to Visit Tempe, Arizona!. Where Do the Pros Go? Today I'm in Dallas. After a less than satisfactory experience last night at the Euless, Texas Microtel (the worst being loose grab bars, improperly installed in the bathtub) I am enjoying a restful evening at the Fort Worth Microtel. But I was asking myself, "Where do the pros go to research inclusive travel for their own agenecies?" "A Tour For Tour Operators, Travel Writers: Foreigners Take SW Florida Snapshot." What Can a Traveler with a Disability Expect in Sweden? Before you travel it can be helpful to get some insights from the locals. In Sweden you might want to look at DHR here if your Svenske is up to par (Yah, sure, you betcha mine is not!) Or the English language subset if it's not. Public accessible transportation is at least as important to visitors with disabilities as their local cousins. Planners forget that universal design has the added fiscal impact of allowing travelers with disabilites to discover a place. Here's a news bit from Ararat, Australia. Is my geography off or didn't Ararat used to be closer to where Noah disembarked from his famous cruise? (Comtex Business Via Thomson Dialog NewsEdge)WASHINGTON, May 17, 2006 (U.S. Newswire via COMTEX) --National Council on Disability (NCD) today released an NCD Position Paper on Access to Airline Self-Service Kiosk Systems -- http://www.ncd.gov/newsroom/publications/2006/kiosk.htm -- calling on the U.S. Department of Transportation (DOT) to adopt an updated Air Carrier Access Act (ACAA) standard for accessible design applicable to these kiosk systems and that DOT then initiate settlement negotiations with covered air carriers and airports to bring their kiosk systems into full compliance. Continue reading Inclusive Travel Goes Mainstream in the Disability Rights Establishment. "Is it Getting Easier to Travel with a Disability?" Judith Cameron says, "No." Read her story published in the Telegraph, " Not Quite Access to all Areas." OK, I give up. You figure this one out! O’brien was hit by a car at the intersection of Charlotte and 20th North. “I went out of the chair probably two feet from where I was struck,” he said. His wheelchair took a beating. "It was smashed like a coke can,” he said. It has a flat tire, the arms are useless and the wheel cover was ripped off. "I asked for them to take my chair to the emergency room, so that I can drive it back here, but instead it was taken to an impoundment lot,” he said. To get his wheelchair back, O’Brien has to pay $85. Special thanks are in order to freelance journalist Helena Bornholm and the Swedish Institute for the article "Sweden – Accessible to all Tourists." The city of Stockholm has begun an accessibility project, which is actively working to make street environments accessible and easy to navigate for persons with mobility impairments. Let's hope the slow start means that extensive planning and resources have been allocated to make this a success. Continue reading The Swedish Institute and Inclusive Destination Development. If you are able to get to the May 18, 2006 opening of the the Mercedes-Benz Museum in Stuttgart the staff there is certain you will find it wheelchair-friendly. The seven Legend rooms, which guide visitors through the history of the automobile and its times in chronological order, are linked by an around 80-metre long, smooth ramp. This is designed to be equally convenient for the handicapped, with numerous imperceptible transitions to level sections so that wheelchair users are safely and comfortably conducted through the building. 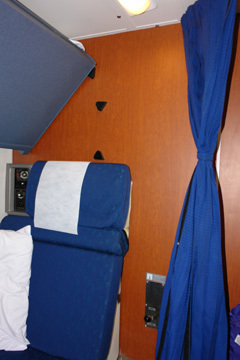 With the exception of the first and last, which are devoted to the invention of the automobile and motor racing history, all the Legend rooms are laid out on the same principles: along the outside of a curved, clover-leaf wall, the ramp sweeps down to the vehicle display in its historical context. While the visitor is already able to see down to the exhibits, a chronological table on the left wall illustrates events in corporate history in the light of their historical period. This gallery shows the background against which epoch-making innovations in automobile engineering were made. Continue reading Still Time for Stuttgart and the Mercedes-Benz Museum Opening. Continue reading Explore the Lower Sunshine Coast. The official English translation of the Carta do Rio / Declaracion de Rio is available below. Continue reading Universal Design for Sustainable and Inclusive Development. ...and Candy Harrington, author of Emerging Horizons magazine & blog as well as Barrier-Free Travel: A Nuts and Bolts Guide for Wheelers and Slow Walkers, came to my rescue -- as usual! 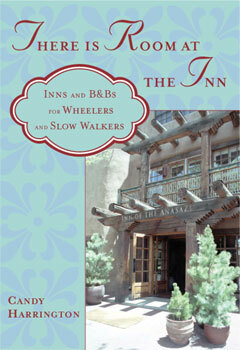 Take a look at her new book There Is Room at the Inn. Here's a list of guides on building or altering homes to suit the needs of the elderly or disabled. Continue reading Web Resources for Universal Design. Types of Tourism: "Health Tourism"
The tourism industry segments the general market of travelers in order to understand its market. Seniors, families, students, various nationalities or ethnicities, luxury travelers as well as people with disabilities all fit into that universe. Wikipedia's entry on tourism got me to thinking about "Health Tourism." Now, anything dealing with medicine and disability runs the risk of controversy and hijacking into arguments about limits of the "medical model of disability." However, there is an actual industry around travel for medical purposes -- and tourism while at the destination - that is quite competitive. Some basics are discussed at the blog Jigsaw Puzzle:::::: . Continue reading Types of Tourism: "Health Tourism". As Buddhists, Zagrodnik and her business partner Scott Thomas see their work as a well-planned holistic view of human nature and their environment. “In a spiritual sense, we are just being responsible human beings.” “Universal” should in no way be taken to mean “impersonal.” The key term in universal design is “flexibility” and it's never too late to incorporate this idea into your home, either by remodeling storage space to be more accessible, or rearranging furniture throughout the house to allow rooms to be used by multiple people for multiple purposes. There's a lot of beauty in universal design–both in theory and in actuality. “Because the underlining idea is conscientious planning, our designs also use more natural light and windows, and gradual levels to accent space, which can really be beautiful.” Ultimately, universal design means eliminating distinctions between "abled" and disabled. 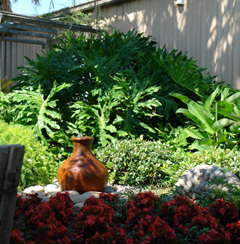 The concepts of ageless design don't have the stigma that the public may attach to recognizable “handicap” facilities. July 13-14, 2006 will be the Universal Design and Visitability: From Accessibility to Zoning Conference. The event is sponsored by the Ohio State University in collaboration with the National Endowment for the Arts, the John Glenn Institute for Public Service and Public Policy, the Kirwin Institute for the Study of Race and Ethnicity, are sponsoring a two-day seminar on universal design and visitability. Planners, designers, planning commissioners, elected officials, disability professionals and the general public all can benefit from this conference. If its on the Internet and its about Universal Design eventually it comes to my desktop. Even with that constant flow of information certain articles stand out. Lynda Guydon Taylor caught my attention with her concise description, "...Universal Design, which means accessible housing intended for multigenerational living." Read her whole piece, Home Showcase: Comfort in a Rustic Ranch House at the Pittsburgh Post-Gazette. Continue reading Accessible Housing Intended for Multigenerational Living. The Baby Boomer segment of the travel market, in terms of expenditure, will continue to grow over the coming decades, while Generation X is fast becoming a driving force. The smaller Generation Y tends to stay at home, having become "slaves to the screen". Delegates to the 55th Pacific Asia Travel Association (PATA) Annual Conference learned this during the April 25 plenary session on "Baby Boomers and the Challenge of Generations X & Y", moderated by Editor of PATA Premier Partner magazine TIME International. Continue reading Baby Boomers and the Challenge of Generations X & Y. Travel information must be available to travelers with disabilities also and the web ihe most popular sources of travel information. Web designers have the opportunity to annually hone their ability to reach the inclusive travel market and more at Access U 2006 on May 11 and 12. Continue reading Access U 2006 from Knowbility. Want to be a Travel Agent? Travel agencies may be disappearing from the mall but travel agents have adapted. Here is an advertisement for A-1 Travel Vacation making an appeal to retiring Boomers. Let's hope that the new crop of agents continue to bring the wisdom of Universal Design and Inclusive Tourism to the travel industry. "Universal Design...is Anything but Universal"
Alex Cukan writes about the best shower of her life -- a luxuriously large, universally designed one at the Ramada Renaissance in Washington, DC. Home builders, contractors, and realtors all know that the "home spa" approach to bathrooms is here to stay and is one of the best returns on investment when remodeling a home for resale. Wouldn't standardizing hotel showers as roll-in size begin to meet guests' expectations of comfort? I have had travel agents tell me that cruise ship passengers have faked disabilities just so they can get the wheelchair-sized showers. Why not make comfort and style ubiquitous?